Just like mice, they’re cute and lovable until they swarm you. Or get inside the wainscotting. wow, this is my new favorite! 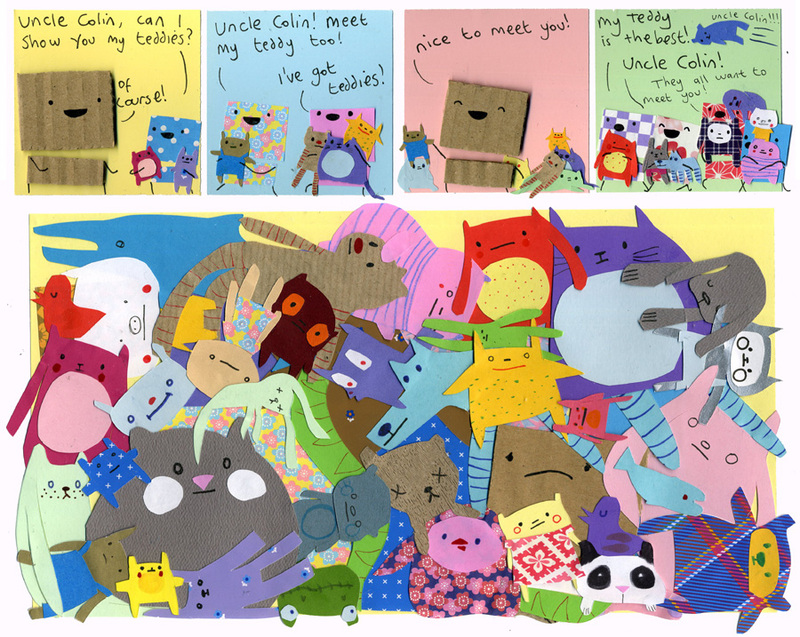 so many wonderful colors and textures, plus a cute little storyline! i love the nieces and nephews. wow i agree the colours in here are amazing! Wow, Colin must be pretty comfy there; why is he so unhappy? The purple one on the top right looks like Totoro! hey look, is the small yellow one pikachu? I thought the polar bear was gonna jump in there and tear everyone apart. i just <33 the teddies!!! i lyk the brown one with the x.x eyes. I kind of want to know how they each inflated to the approximate size of Colin in the last panel. Where can I get a teddy like that? Why would you ever be sad about being engulfed in teddies? The flying Teddy in frame 4 is the best. this is a good comic but… I just hope you think about what you are doing to the environment and all the trees that have been destroyed with your making of this comic. Nothing else, just hope you think about it. Guess what? I just asked, and none of the trees I spoke with had any objection. Carry on, Philippa! You’re a good guy but… If you kill yourself, think about all the water, paper and electricity that would be saved. Nothing else, just hope you think about it. Aw, this reminds me of that scene in E.T. when he hides in the kids’ closet. There’s a teddy bear that looks like Polar Bear! !